Being a Hypothyroid patient for a number of years I know personally quite a bit about this topic. Not only through my own symptoms and experience, but through extensive research I did over the years. After finding out I was suffering from thyroid imbalance, I hated the idea of taking hormone replacement therapy for the rest of my life so I wanted to find out if there were any other ways to go about making the thyroid function normally again. What is Thyroid and its function? The thyroid is a butterfly-shaped gland that sits low on the front of the neck. Your thyroid lies below your Adam’s apple, along the front of the windpipe. To do its job, the thyroid needs a chemical element called iodine that the body absorbs from the foods you eat and the water you drink. The entire body contains about 50 milligrams of iodine. About 1/5 to 1/3 of that supply (10 to 15 milligrams) is stored in your thyroid. The thyroid combines the iodine with tyrosine (an essential amino acid) to make important hormones. Every aspect of your metabolism is regulated by thyroid hormones. Your thyroid produces two main hormones, thyroxine and triiodothyronine, that influence every cell in your body. They maintain the rate at which your body uses fats and carbohydrates, help control your body temperature, influence your heart rate and help regulate the production of protein. Your thyroid also produces calcitonin, a hormone that helps regulate the amount of calcium in your blood. The rate at which thyroxine and triiodothyronine are released is controlled by your pituitary gland and your hypothalamus — an area at the base of your brain that acts as a thermostat for your whole system. The hypothalamus signals your pituitary gland to make a hormone called thyroid-stimulating hormone (TSH). 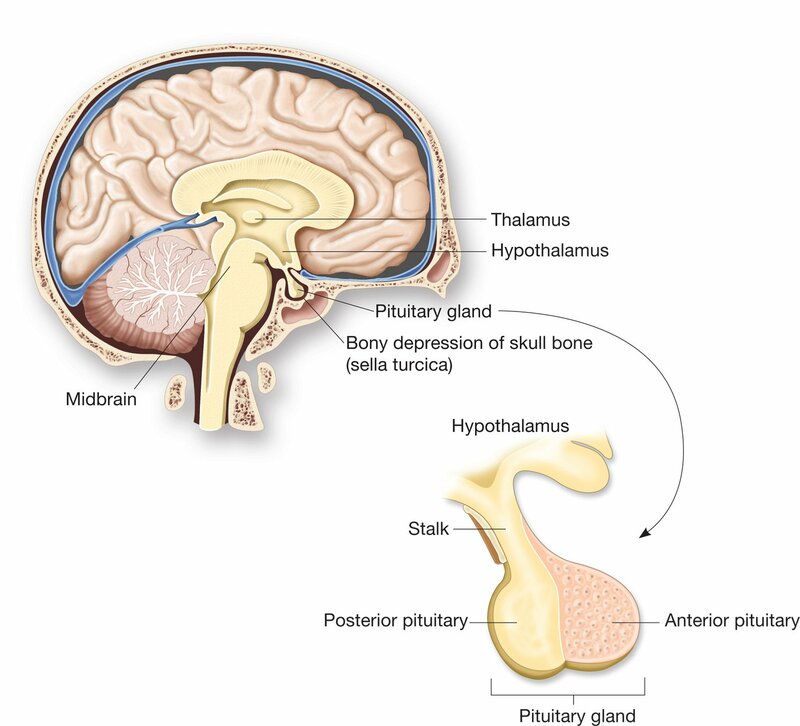 Your pituitary gland then releases TSH — the amount depends on how much thyroxine and triiodothyronine are in your blood. If you don’t have enough thyroxine or triiodothyronine in your blood, your TSH blood level will be above normal; if you have too much, your TSH level will fall below normal. Finally, your thyroid gland regulates its production of hormones based on the amount of TSH it receives. What causes your thyroid to go haywire? It could be genetics, an autoimmune attack, pregnancy, stress, nutritional deficiencies, or toxins in the environment, but experts aren’t entirely sure. Because thyroid hormones far reach in the body—from brain to bowels—diagnosing a disorder can be challenging. 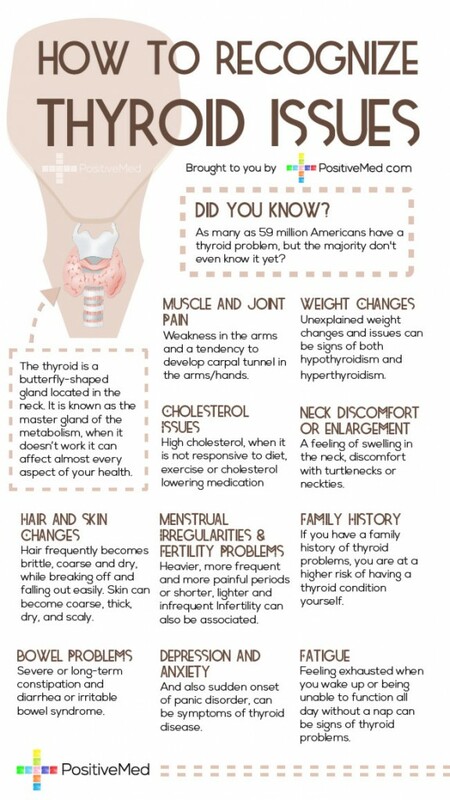 I had most of these symptoms before I was diagnosed and I remember for many years my neck was rather enlarged, but I didn’t realize it was a thyroid problem. After I started taking the medication (hormone replacement therapy) my symptoms slightly improved, but most of them were still there. I still had an enlarged neck, extreme fatigue in the afternoons, brain fog, hair loss, mood swings, easy weight gain and constipation. But my thyroid T4 and T3 levels were normal in my blood test. All these are due to metabolism and absorption of thyroid hormone. Most of the natural ways to control your thyroid hormone production is with a strict diet and adding necessary nutrients and good proteins into your daily meal plan. 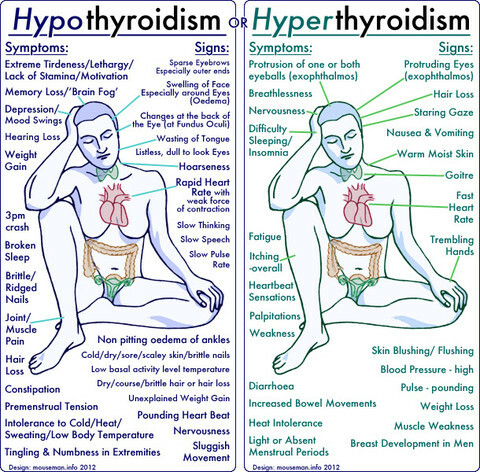 This diagram perfectly summarizes the symptoms and problems faced by Hypothyroid vs. Hyperthyroid patient. In hypothyroidism too little hormone is produced and therefore everything slows down and in hyperthyroidism too much hormone is produced, therefore the body’s metabolic rates speed up. If you look at the signs and symptoms they are mostly totally opposite for the two. Antithyroid medicines work best if you have mild hyperthyroidism, if this is the first time you are being treated for Graves’ disease, if you are younger than 50, or if your thyroid gland is only swollen a little bit (small goiter). Radioactive iodine is often recommended if you have Graves’ disease and are older than 50, or if you have thyroid nodules (toxic multinodular goiter) that are releasing too much thyroid hormone. As I mentioned earlier, even though I was taking my hormone replacement therapy I still had most of the symptoms and improvement was only slight. Once I learnt that lingzhi and pollen can help in reducing my medication or eventually even completely eliminating it, I was really curious to see the results. The most obvious and fastest result was that my energy levels improved tremendously. That sluggish and lethargic feeling I used to get after 3pm, was completely gone. Then, my memory and concentration started improving and I could focus a lot better on my work. That ‘Brain Fog’ which I used to get quite often was no longer there. After a couple of months, I noticed that my thyroid swelling has gone down a lot, which it was unable to do previously with the medicine. Constipation improved a lot as well and I don’t gain weight as easily as before. I must say I was quite impressed, as even after taking medication for more than 2 years none of these symptoms were able to improve. Despite telling my doctor all these while that my symptoms are still there, especially the tiredness, she couldn’t help me in any way as my blood tests were showing that the levels were normal. Just recently I’ve done another blood test and the results show that I actually have antibodies which are attacking my thyroid and doctor said that eventually I will have to keep increasing the dosage of my medicine. But what he doesn’t know is that I hardly take my medication now and the levels are still balanced so lingzhi should be able to help my thyroid to continue working and protect it from the antibodies. This is called Autoimmune disease – Hashimoto thyroiditis. Either caused my genetics or some bacteria/virus infection. Lingzhi can help both Hypothyroid and Hyperthyroid patients as it modulates the activity of the thyroid glad so that it functions at its optimum. Pollen, not only brings in the necessary nutrients which your body’s cells need to be healthy, but it also balances the hormones. For those who experience any of these symptoms mentioned in the diagram please request for a thyroid blood test as those yearly blood examinations sometimes don’t include the thyroid test. Also if you or any of your friends and relatives has an enlargement on the neck, please ask them to check their thyroid levels. According to the recent study Hashimoto’s thyroiditis is triggered by Iodine excess or exposure to the radioactive iodine isotope during childhood. have you looked into gluten-free diet or selenium supplementation to reduce TPO AB’s level? Im so glad to find your post.S so informative! I just found out I have high TPO &TGO though my TSH is normal. I would prefer a natural way too for help.than to take medicine! Thnak you!!! Hi Betsy, glad you like my post! Yes there are certain natural remedies, but it is mostly a very strict diet. Do research about it. However, sometimes we do have to resort to medicine if nothing else helps.